Our group began our trip with a half-day meeting with chief officers of the Comisión Federal de Electricidad Transmission of the State of Mexico. The meeting was extremely fruitful and comprehensive. The CFE officials presented the different component damage and failures from all the substations where either severe or moderate damage were observed. They also presented the damages and failures to their power systems. They then arranged a tour of the power substation in Morelos, and the team came back late in the night. The next day, we split into two smaller teams. 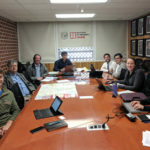 One team met with the telecommunication sectors in the city; the other went to the Del Mar area to investigate the pipeline damages with help from two UNAM professors, Mario Rodriguez and Raul Flores. When the team arrived, the damaged pipes had been fixed, and repair staff were working on repaving the surface after the repaired pipes were completed. The team talked to the workers and local residents to collect relevant information and water shortages in this area. Other than the pipeline damages, there was significant damage to the sidewalks, roads, and utility poles in the Del Mar area of Tlahuac. 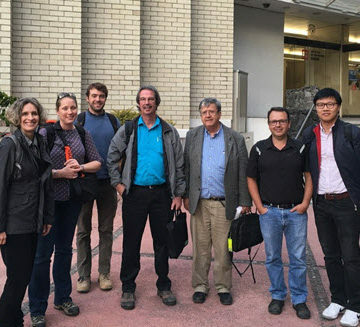 In the afternoon, the second team was accompanied by a graduate student to investigate the damaged buildings in the downtown areas of Mexico City. 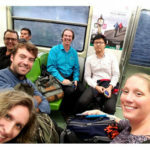 A day later, , the whole team went to check out the area closer to epicenter in the Puebla. 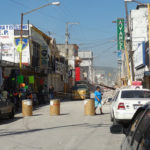 The damage to the Puebla was less significant, though there is visible damage to several historic buildings in the downtown area. The damaged buildings were shored up temporarily. Meanwhile, two churches west of Puebla sustained significant damage. A breakfast meeting with Prof. Norberto Dominguez and Prof. Sergio Cruz Leon from the Instituto Politécnico Nacional was set up. 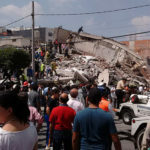 The meeting started featured information and data sharing regarding what the situation was like in Mexico City after the Sept. 7, 2017, earthquake. Prof. Norberto shared how the students from IPN were responding to the disaster by volunteering. The volunteering efforts were self-initiated and made complicated by the difficulty of connecting voice calls. The students relied mainly on Whatsapp to coordinate. Overall, the the trip was very successful.